Sussie uses her many talents and training to focus on massage therapy and aesthetics here at SPA LUX. Surrounded by most of her family, Sussie grew up in Costa Rica, where she traveled to the beach and learned Spanish as a native language. With a professional background of a Physical Therapist, Sussie specializes in aesthetics and medical massage. She uses a variety of therapies to help people with their health and especially their aging concerns. 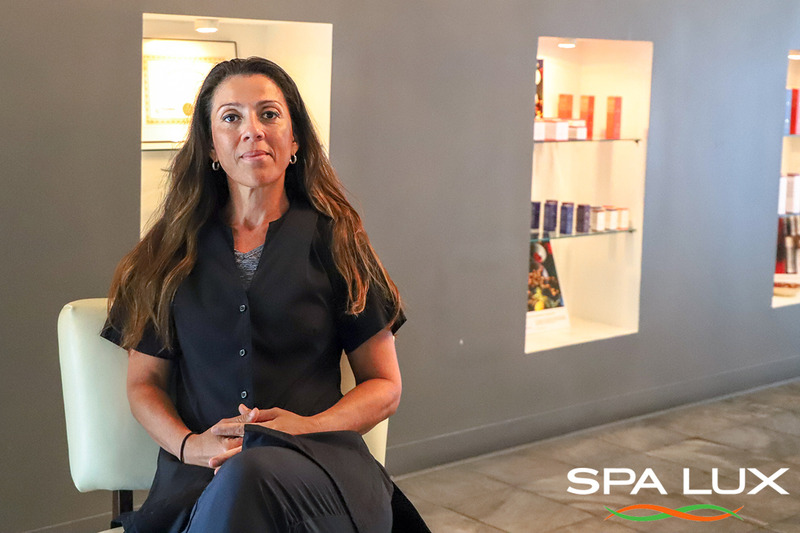 Her favorite service at SPA LUX is facials, giving individuals the opportunity to relax while improving the health and appearance of the skin. The service Sussie like to recommend to clients is the SPA LUX Signature Facial. This specialized service uses steam and Sundari skin care products, soothing the skin and giving it a natural glow. She advises new clients to ask as many questions as you like, be open to your concerns and communicate with every person you encounter – including the front desk. Don’t forget to arrive early for your appointment so you can take advantage of SPA LUX’s facility. Her hobbies include catching free concerts around the Tulsa area, enjoying the outdoors at Guthrie Green, running and water sports and activities. In particular, her new favorite hobby includes sailing on the open waters. Sussie has traveled the world, learning about new cultures and having the chance to site see some of the prettiest towns in Italy. In Northern Italy, she visited Florence, a town so picturesque it reminded her of a fairytale. Summer is a Tulsa native with over twenty years experience in massage therapy. Summer uses her skills to focus on targeted Deep Tissue Massages - she believes the type of treatment is very therapeutic and can be used to alleviate medical issues. Setting work aside, Summer loves spending time with her children. You can find Summer and her kids enjoying Oklahoma’s beautiful outdoors playing in the park or using their adventurous side to ride go-carts at Incredible Pizza. One piece of advice Summer would like to pass on is for first-time guests to mute the outside of the world by turning your phone off, unwind and let SPA LUX take care of you. With a wide range of services, you’ll leave the spa feeling refreshed and rejuvenated. Summer states SPA LUX’s atmosphere is different from your typical spa; she believes SPA LUX encompasses a day spa atmosphere, being one of the only types of spas with its luxurious amenities. Summer’s favorite type of treatment at SPA LUX is the new Dermaplaning service. This service can be scheduled several times throughout the year, focusing on making the skin healthier and brighter. One day she would like to travel to Italy where she can experience a new culture, try new food and create new memories. Indulge yourself and delight your senses with our delicious Himalayan Rose Scrub. This delicate, aromatic sugar scrub is abrasive enough to exfoliate your skin, yet gentle enough to make your skin feel smooth, soft and hydrated with nutrients. This luscious scrub contains Pink Himalayan Salt, organic essential oil of Rose, ground Rosebuds, ground Rose hips and Chamomile flowers. Rich in essential fatty acids, minerals and Vitamin C this scrub will regenerate and repair skin cells to prevent premature aging, while you will be swept away by the intoxicating sweet aroma of a Rose garden. French Pink Clay is used as a mask for your entire body. It is smooth and velvety when applied and has a powerful detoxifying effect. It will pull impurities out of pores and will replenish your skin with beneficial minerals to create an overall refreshed and radiant appearance. This clay is excellent for cell renewal and healthy skin rejuvenation. It will improve elasticity due to the high content of Iron Oxide and Silica along with high content vitamin C from Rose hips. SPA LUX announces new service, Dermaplanning, which will expand facial services offered to clients in Tulsa, Oklahoma. Dermaplaning is an exfoliation procedure performed by a licensed professional. This particular treatment removes dead skin cells, resulting in healthier, brighter skin. Dermaplaning requires the use of a scalpel – an aesthetician gently shaves the face, removing the top-most layer of dead skin along with vellus hair (peach fuzz). This exclusive treatment is beneficial for all skin types. From air pollution to makeup, your face builds up a layer of dead skin cells. Dermaplaning helps remove dirt and oil accumulation from the excess of fine hairs. Once the top layer of the skin is removed, your skin will have a shiny, healthy glow. The procedure can also minimize superficial acne scarring, uneven skin tone, and diminishes the look of fine lines. If you have an active breakout, we recommend you wait until the breakout subsides until you schedule an appointment. Dermaplaning is a quick treatment. The service is performed in under 30 minutes and there is no downtime post-treatment. Appointments can be scheduled during a lunch break or even a quick visit before work. After the procedure, you will notice applying makeup becomes smoother on your face. The removal of fine hairs allows makeup products to penetrate the skin deeper. Dermaplaning results can last up to three to four weeks – it is recommended to schedule appointments monthly. Removing the top-most layer of the skin removes a barrier to protect your skin from the sun. We recommend using SPF after the treatment. Your face will be extremely susceptible to the sun. Dermaplaning is a less evasive procedure than microdermabrasion. Microdermabrasion uses crystals and vacuum suction to exfoliate the skin. The vacuum suction loosens the skin cells from the face, leaving your skin feeling smoother. Dermaplaning leaves the face with a natural glow by removing facial hair – something microdermabrasion cannot do. Appointments can be booked online or by calling us at 918-615-3339. Set the mood by visiting Tulsa’s only urban day spa. SPA LUX offers an array of services leaving you looking and feeling brand new. The Duo Lux Package is the couple’s favorite! Enjoy a relaxing foot bath in our tranquility lounge and then melt away the stress with a 55-minute Side-by-Side Couple’s Massage and a 55-minute Side-by-Side Facial. Book your appointment here. Next, grab a snack and a refreshing glass of wine at the Wine Loft Bar. The Wine Loft Bar is Tulsa’s premier wine bar in South Tulsa, offering over 200 varieties of wine. A list of signature cocktails and menus are available to view on their website. Wrap up the date with a romantic dinner for two at Boston Deli and Market. Boston Deli has put together a fabulous Valentine’s Day menu offering a selection of foods varying from Hasty-Bake Blackened Ribeye to Seared Salmon. You don’t want to miss out on this appetizing meal! Check out the menu on their Facebook page. TIP: Don’t forget the flowers and make reservations well in advance! Do you like showering your loved ones with gifts during Valentine’s Day? We have put together a list that will leave them blushing! Surprise your snookums’ with a Barbee Cookies heart cake! These scrumptious cookie cakes are baked with the finest ingredients and are the perfect way to say ‘I Love You.’ Just place your order online. That’s not all! Give the gift of relaxation with a day at the spa! Escape from all the stress and schedule a Side-by-Side Couple’s Massage or purchase a gift card at the spa or online. Unwind with a therapeutic Swedish massage at our peaceful oasis! Enhance the date by adding on our Side-by-Side Instructional Add-On Massage. End the night by enjoying the company of one another, and snacking on a cheese plate and sipping a glass of wine. Visit WholeFoods for all your cheese needs and pick up your favorite bottle of wine to share. TIP: Decorate your space a little. Rose petals and a few heart balloons will go a long way! And for the cheese plate, try one soft cheese, like goat cheese and one hard cheese such as Manchego, add some fresh grapes, walnuts, your favorite crackers, a jam and you are all set. Start the date with a special card from Dwelling Spaces. Tell her how much you care about her, how much you appreciate her, and let her know that she is very well loved! Need ideas of what to put inside the card? We can help! SPA LUX gift certificates make a perfection addition to any gift this Valentine’s Day. Let your lucky lady feel refreshed and renewed with the SPA LUX Signature Package. This package includes some of our most popular services: a 30-minute Citrus Sugar Body Polish, a 55-minute Swedish Massage, and a 55-minute Signature Customized Facial. Looking to surprise your man with a day at the spa? Gift him with the Gentleman’s Package! Your man can take the day off and unwind with a 55-minute deep tissue massage and a 30-minute gentleman’s mini facial. Gift certificates are available to purchase for specific packages or a set dollar amount. Get yours here. Hop on a trolley with your loved one and get a guided historical tour of Tulsa’s most famous love bird’s residences and landmarks. Once the tour is complete, enjoy a coursed dinner, dessert, and a champagne toast! Tickets can be purchased here. Celebrate love at the first-ever dinner at the Dead Armadillo Brewery this Valentine’s Day! The Bachelor’s Table will be serving a 5-Course dinner, paired with 5 Armadillo beers. The brewery will even be releasing exclusive-only brews! Find more information on their Facebook page. Finish the night with a drink at “A Very Vintage Valentine’s Day” hosted by Vintage 1740. This event is taking place on Valentine’s Day from 3 PM to 11 PM. Savor the wine and chocolate desserts provided by Glacier Confection. Learn more about the event on Facebook. TIP: Make sure to have your plan in place and make reservations in advance. The night will be perfect!